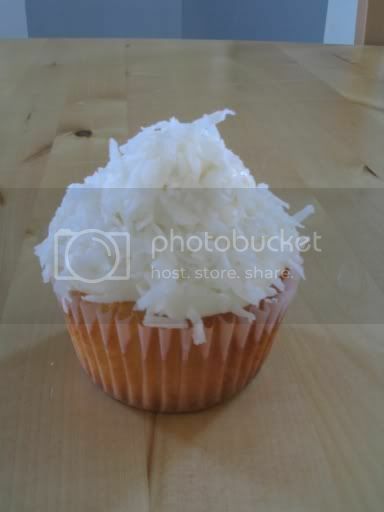 Cupcake, my love: Happy New Year! Happy New Year Bloggers! It's hard to believe that we have headed into the year of 2008! It seems like just yesterday I was a young fifteen year old, begging my parents to let me go out with my friends to celebrate the new millennium, and now here I am, eight years later wondering where time went! Oh, well no time to dwell on what was...because I've got a lot planned for this upcoming year. After searching through many different options of "what to be when i grow up", I think I have finally decided! My plan is to go back to school in the fall and get my Master's in Education and become a High School English teacher. Which I am so excited about! With that being said I wanted to share with you my special New Year's Eve treats. 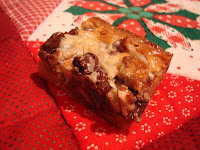 The first is a recipe that I found on BettyCrocker.com, which uses a packaged chocolate chip cookie dough mix. 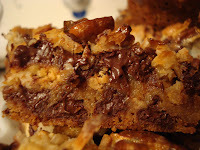 These goodies are known as Luscious Layer Bars and will totally knock your socks off! The chocolate chip cookies are the base to the butterscotch, chocolate, coconut, pecan, white chocolate topping. 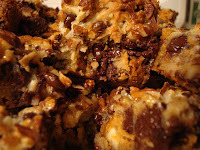 Similar to Seven Layer Bars, these bars are so moist and gooey, and full of sweet, sweet flavor! When I took these bad boys out of the oven I just couldn't resist, I got a spoon and dug out the corner, revealing a melty, oozy, warmly soft morsel, which I immediately devoured! These second little gooey I made was a mini cheesecake which I found on the Pillsbury Website. (who has time, with drinking and staying up late, to actually make recipes from scratch!) 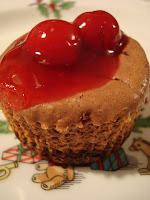 These scrumptious cheesecakes are called Black Forest Cheesecake Desert Cups, which are so easy to make. My favorite part of the recipe is that the base of the cheesecake is actually packaged brownie mix. I'm a huge brownie fan, so I was very very satisfied when I saw that on the recipe list. 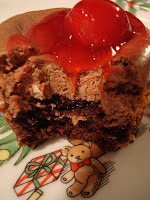 The brownie is then topped with a creamy chocolate cheesecake, and covered with cherry pie filling! All it takes is one bite of this cheesecake to turn your world upside down!! Happy New Year everybody and may 2008 be the best year yet!! Wow, those look decadent and gooey. Fantastic.